While we don't have a TON of wall space to hang things, and I'm more of a less-is-more gal, there certainly are a few spots around the house calling for some artwork. The first spot we focused on was the front entryway. Formerly the half bathroom with a pocket door, the front entryway is now open to the rest of the house. I have always wanted an Eames Hang-it-All in the house, and when Herman Miller introduced an all-black option, I finally committed to it. The Hang-it-All, to me, is a piece of artwork in itself, so finding the perfect prints to accompany it was on my to-do list. 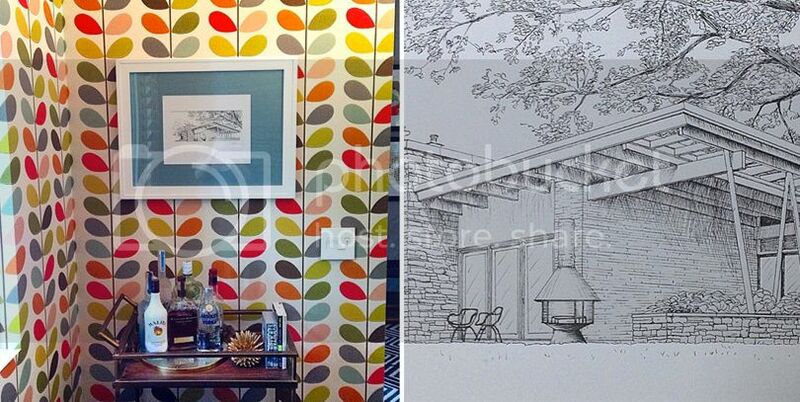 I have a friend, Rachelle, who has an amazing MCM home (which I'd love to feature here in the coming months!) in Eagle, Michigan, and she had some great, graphic prints from Etsy artist, Thedor, in her home. I immediately thought of them, and began to search. In no time, I was picking out my favorite two prints for by the front door. 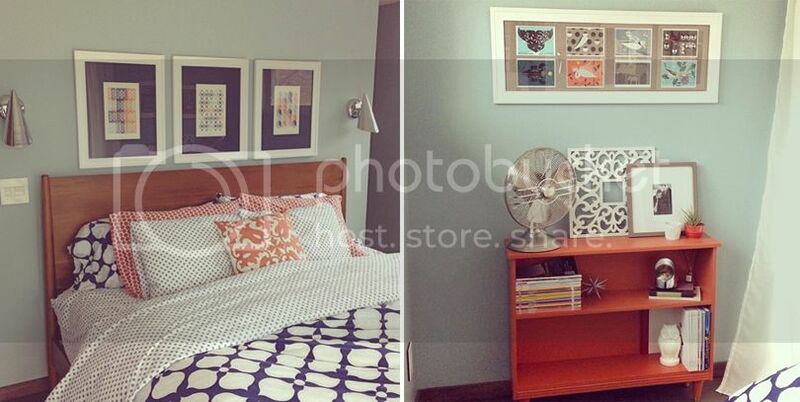 While the walls are gray, and the floor is also gray, you can see our crazy-awesome Orla Kiely wallpaper, so I knew I wanted complimentary colors in the prints I decided on. In no time at all, I was checking out on Etsy, and in a matter of days, the prints arrived at the house. I ran them to Hobby Lobby - my all-time favorite frame/matte shop because of their heavy-duty, simple frames, and very affordable mattes - and in a week's time, they were back at home ready to be hung. The second area we focused on was our master bedroom. Again, I turned to Etsy artist, Thedor for three prints for over our bed. This time, I reached out to him directly and asked for something in blues & oranges to coordinate, but not match perfectly, the colors in our linens. I LOVE how these three images turned out. I had them matted in navy blue, and frames in my favorite Hobby Lobby white frame. The second area was to hide a not-in-use TV hookup above the orange bookcase. I already owned this coordinating frame and really wanted something different in here on the cheap until we either hang a TV (which we don't think we will at this point), or find some amazing art piece to go here. I ended up LOVING all the Charley Harper prints I saw in Palm Springs, so decided instead of spending a small fortune to get a print, I'd buy two sets of his postcard books on Amazon, pick my favorites in hues of orange, blues, grays and have them matted in the pre-owned frame. Voilà - exactly what I was hoping to achieve for under $75! Our dining area is quite tiny - this is the only wall that isn't a window or a fireplace, so finding the right piece of artwork for here was something I held out for. Have a custom drawing of MidModMich was always on my list of things I would love to own. When Caroline at Paloma's Nest shared an image on Instagram of a custom piece her husband, José, did, I knew he was the right artist to do this for us. As a surprise for Greg's birthday, I commissioned this piece. When it arrived, you guessed it, I headed to Hobby Lobby with a frame I already had, to have matted in this gorgeous blue that coordinates with our Orla Kiely wallpaper. This is certainly a favorite of ours! While our guest room has actually acted as a guest room about one time, I wasn't in a super hurry to get things on the wall in here. It does double as my home office currently, so when the mood strikes, I have made some time to pretty it up. I came across some brass & black sea urchins at Target a few weeks back. I bought three sets of 3, and they are literally still sitting on the bed like in the photo above. I need to come up with the final arrangement and get these babies on the wall. My fun find from our camping family adventure last week in the Upper Peninsula was this signed Ikki Matsumoto print at an antique shop in Houghton, Michigan. I do want to get this re-framed at some point, but for now, it's sitting up against the wall on top of the dresser in here, along with a collection of other family photos and I don't hate it yet. I'm actually (finally!) out of frames from other/old projects, so I'd need to invest in something for this one. And the final pieces of artwork I have to share are a couple of random pieces I've picked up - actually, both for the bathrooms in the house. I picked them up because I loved them, not because I knew where I'd be putting them. The birds is a print by Roger Tory Peterson, which I picked up in Munising, Michigan last week. I loved the orange, green and blue, and while I'm not a huge bird fan, I knew this would go somewhere perfectly in our home. It's going to be a perfect fit in our currently art-less master bathroom, right above the hand towel holder. The oil painting of the bowl of red tulips caught my eye at a little shop in Pentwater, Michigan. It has a signature on it, and is dated 1967 on the back. I didn't LOVE the large frame when I picked it up, but come to find out, its almost a perfect match for our cupboards, and looks like I had it framed to match them. It's currently hanging over the hall/kid bath toilet, and I think it will stay there. It's a great pop of color in the otherwise blue, gray and white bathroom. 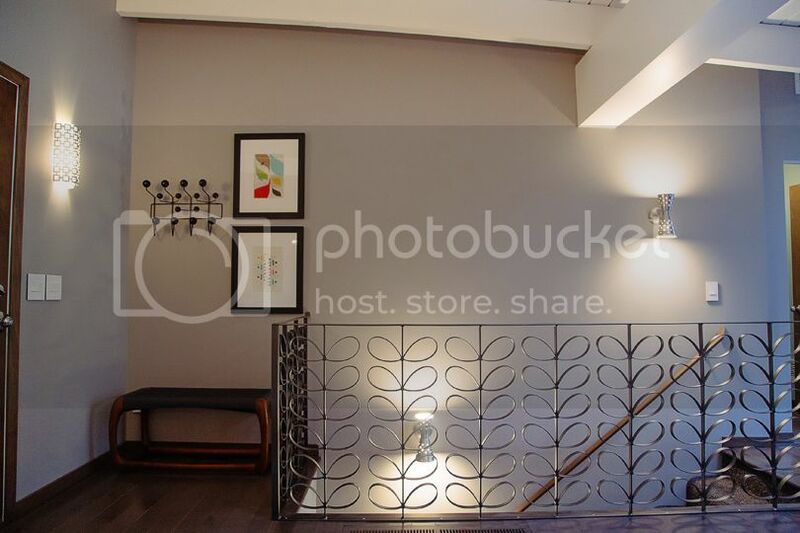 Where did you get the Orla Kiely-patterned stair railings?!? They are fabulous! Abra - they were a custom project by my fabulous husband!